Manufacturers of Android devices may have scoffed at the notion of a 64-bit smartphone when Apple unveiled the iPhone 5S last year, but those same hardware makers are apparently tripping over themselves to play catch-up now. 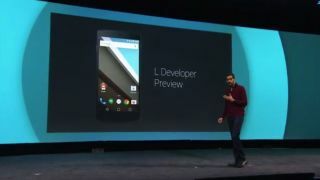 Hit-or-miss DigiTimes has word that Google's forthcoming Android L operating system appears to be moving up the timetable for adoption of 64-bit hardware capable of taking full advantage of the OS. According to unnamed industry sources, 64-bit CPUs could become "mainstream technology" for Android smartphones by the end of 2015 now that manufacturers have stepped up efforts to adopt the speedier architecture. Lenovo, K-Touch, Huawei, Vivo and HTC have all reportedly signed up for Qualcomm's 64-bit Snapdragon 610, 614 and/or 410 processors, all designed with rapid migration to Android L in mind. 64-bit processors from rivals MediaTek and Samsung have already started making their way into the supply chain, with MediaTek's architecture reportedly in the hands of "China-based handset vendors." Samsung apparently plans to keep its own 64-bit technology closer to home with in-house smartphones for the remainder of 2014, presumably expanding availability for other customers next year. Huawei subsidiary HiSilicon Technologies also appears to have a roadmap to 64-bit laid out, but sources claim those processors won't appear until the first half of 2015 at the earliest. Google still hasn't confirmed an official launch (or even a final name) for Android L. However, rumor has it Android L could release as soon as next month, and with the furor building around 64-bit phones, we likely won't have to wait much longer for the next-gen OS. Take a gander at our review of the Motorola Moto X (2014)!